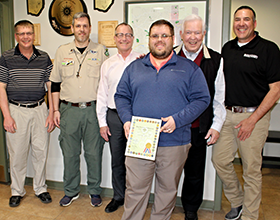 The Wright Brothers District of the Boy Scouts of America recently recognized the Centerville-Washington Park District as their Outstanding Organization of the Year. The Outstanding Organization of the Year award is given to a company or organization for direct service to the program of the Wright Brothers District. The award was presented to Park District staff at an awards dinner in March and to the Board of Park Commissioners at the April Park Board Meeting. Hundreds of young men have completed their Eagle Scout projects within the Park District over the years. Projects have included trail construction or improvements, habitat restoration, and the construction and installation of wildlife boxes, park benches and boardwalks. Scouts have improved more than 25 different parks within the Centerville-Washington Park District, working directly with CWPD staff to plan and implement their chosen Eagle Scout project. Funding for Eagle Scout projects is made possible with grant funding through William and Dorothy Yeck Foundation. William “Bill” Yeck, who is considered the founder of the park district, shared a passion for scouting and established this legacy for generations of Scouts to come. “We are honored to receive this award from the Wright Brothers District of Boy Scouts of America. The contributions made by our local scouts, that improve our parks, are endless. We enjoy working with our local Scouts at all levels and look forward to continuing to grow this collaboration for the benefit of the community for many years to come.” said Ken Carter, Centerville-Washington Park District Operations Manager. The Wright Brothers District of the Miami Valley Council of Boys Scouts of America serves Scouting youth, parents and adult volunteers in the communities of Centerville, East Dayton, Kettering, Miamisburg, Miami Township, Moraine, Oakwood, Riverside, Washington Township and West Carrollton and Germantown.